It's always interesting opening up a package of records that I didn't specifically order. When someone sends something for me to review, I've been sent more misses than hits, but I'm still always hopeful that something new is going to pop in and blow my mind. When you open the package and you see that the band in question is sporting ex-Mono Men, you tend to think there's a better than average chance that you've hit pay dirt this time. This 7" is my first exposure to the DTs and if this 7" is any indication, this is a band I could get behind. 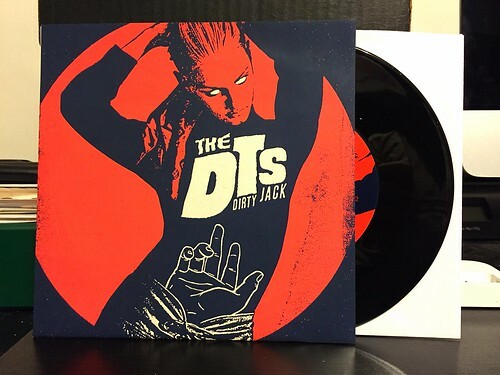 The A-side "Dirty Jack" is a slow building, guitar chugging beast of a song. With the wailing vocals of Diana Young and the repetitious, but hard hitting guitar riff, it's a pretty good time. In many ways it reminds me a lot of a tougher Boss Hogg. On the B-side we have "Restless." This is a cover of a song by the Cobras. The Cobras only released one single on Stax back in the 60's, but you'd be hard pressed to find anything that Steve Cropper and Duck Dunn touched that wasn't pretty stellar. The DTs version is a little meaner and a little louder, but every bit as fun and grooving.